Your Farbman Woolly Mammoth will come when you call him. You are now the proud owner of a wonderful new household pet for you and your family known as a Woolly Mammoth. Your Woolly Mammoth has been cloned for you by Farbman Inc., Cloners of Fine Quality Mammals Since 2011. You will find that your Farbman Woolly Mammoth will make a superb companion and great watch animal, at least so far as we’re able to tell right now with the absolute dearth of information we have. This hastily assembled manual will tell you everything you need to know about the care and handling of your Farbman Woolly Mammoth --- at least so far as we’re able to tell right now with the absolute dearth of information we have. We recommend you read it thoroughly and keep it handy by placing it directly on the body of your Mammoth, but not anywhere such that when you dislodge it for review purposes your Mammoth is seized with an overwhelming urge to breed. In 2010, Professor Lance Lewitsky of the the University of Havertown PA made the discovery of a lifetime while on an anthropological dig in Siberia. Professor Lewitsky discovered that it is extremely cold in Siberia and that for the most part, he didn’t like it. He also discovered the extremely well-preserved remains of an over 10,000 year old Woolly Mammoth, which he and members of his team came to refer to as Zsa Zsa. Determining the mammoth's genetic material was intact, Professor Lewitsky contacted the University’s Department of Opportunistic Scientists, and Zsa Zsa’s DNA was promptly decoded for cloning purposes and a weekend geek-lark. You will need a very large bowl. Unless you are a member of the kitchen staff of New Jersey Governor Christie, look for an abandoned satellite dish at your town’s dump or steal some neighbor’s above ground swimming pool and turn it upside down. 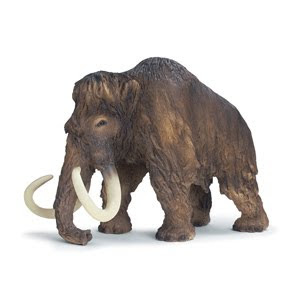 Woolly Mammoths are herbivores. We think. Fill the bowl with whatever you can find outside that’s green, such as grass, bushes, plants, the siding on your house, members of the Green Bay Packers, or actor Seth Green. Especially actor Seth Green. Do this 7 to 8 times a day or until your Mammoth indicates satiation by tusk-nudging you towards the ice cream. You will no doubt encounter many of your neighbors all walking their mundane doggie-woggies. These are the same people who’ve been looking down their noses at you for years, convinced you’re not good enough for the neighborhood. And now, at last you have them! Sidle on over to the snooty Mrs. Goldstein and let her know that while your pet’s heritage harkens back to the days of the earliest cave paintings of Regis Philbin in France, her poodle’s genesis extends as far back as puberty for the last designated Disney Princess. Inform that blowhard Al Cowan that while his border collie begins to shake and quiver at the mere mention of the name Michael Vick, yesterday your pet ate Michael Vick. Make sure Jennifer Horowitz, the still hot 40-something divorcee, knows that when your pet marks off territory the upper boundary is in New Hampshire while when her schnauzer does the same, the northernmost boundary is your shoe. Next, you are going to need a comb, brush, eight or nine foot long hair dryer, and 400 rollers. Allot the remainder of the week. Look for another Mammoth that’s really cute --- but if not, at least one that’s fair to middling with a good personality. Whether or not the family has money or is Jewish is optional and up to you. That’s about all we’ve got for you here. We really don’t want to have to watch what happens next. By following the few simple guidelines above, you and your Farbman Woolly Mammoth should enjoy years of happiness and companionship together! We think. But please don't call us. There is no help desk. There are masses of Mammoth poop though. Because at Farbman Inc. --- Cloners of Fine Quality Mammals Since 2011 --- we can’t even find our own building! And I would like to ride him, rather than take him for walks. I think this would be more fun. Do I need a saddle? It would be more fun for all of us if you ride him, rather than take him for walks. Not sure a saddle will make any difference. Here's the deal. I will trade you my five dogs and one cat, for your one woolly mammoth. Especially if you'll pay me. No, kd. HERE'S the deal! My one Woolly Mammoth will eat your five dogs and one cat. Unless you pay ME! Being the upkeep on this critter is $8,000 a day, I got to make money somehow. He is a little cutie wootie pie, though! Is there a potential trade in mammoth hair? I was just thinking of trying to cover the food costs. That's so cool; that's my grandmother's name!